I love oysters..love, love them. My favourite way to enjoy them is raw with a spicy condiment or freshly grated horseradish. I don't have them often and they are always a treat. 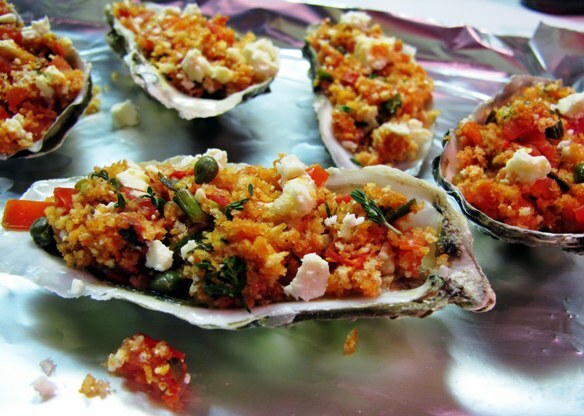 I have never prepared them myself because I was always hesitant to shuck the oysters. Silly, I know, but I was worried about hurting myself with the knife. 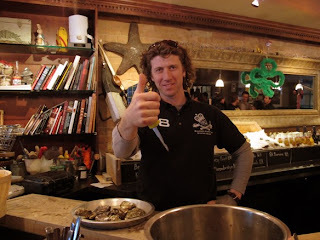 So, when I was invited to the launch party for the Shucker Paddy at Patrick McMurray's Starfish restaurant in Toronto, I was excited. I wanted to practice my new shucking skill so I prepared some oysters this weekend. As I said before, I prefer raw oysters but I wanted to try something a little different. 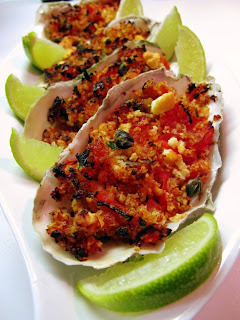 I really enjoyed the fresh flavours of these oysters and I can't wait to make them again. Enjoy! 1. Pre-heated 450F oven with the rack set to the uppermost position. 2. In a large skillet, add your olive oil turn the heat to medium then add your leeks, garlic and tomatoes and simmer while occasionally stirring for about 5-6 minutes. Add the smoked paprika and white wine and simmer for another 2-3 minutes or until the sauce reduces until thick. 3. Now add the capers, dried thyme stir in then add a pinch of chilli flakes to taste. Take off the heat and allow to cool. Add the bread crumbs and cubes of Feta and stir-in and reserve. 4. To shuck your oysters, you’ll need a flat work surface, a tea towel to place in the oyster in and protect your hand that will hold the oyster. Place the oyster cup-side down/flat and stick the oyster shucking knife into the hinge. Jimmy-jammy the knife in the hinge and you will eventually feel the oyster opening. 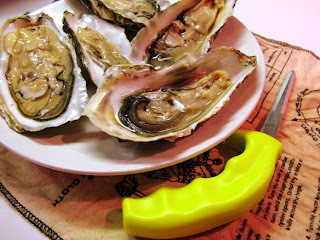 Wiggle the knife and pry the oyster open and then sweep the knife underneath the top shell to cut the muscle off of it. Then place the knife under the muscle of the bottom shell and cut that part too. Remove any visible grit inside the shell and place in a baking vessel that will hold all the oysters. Repeat with the remaining oysters. 5. 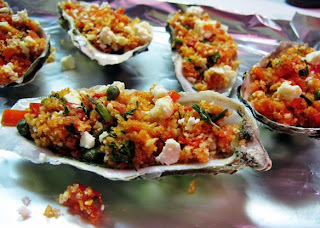 Now simply divide and spoon the cooled filling on top of each oyster and sprinkle some bread crumbs. Place in your pre-heated oven until the cheese has melted and the topping has become golden-brown(15-20 minutes). Carefully remove from your oven and place on a platter with lemon or lime wedges. Serve with Ouzo on ice or a Pavlou Estate Kappa 100 Rose Sparkling made from 100% Xinomavro grapes. Note: Buy your oysters from a trusted fish monger. Ask what type of oyster they are, where they are from and any tips on shucking them. Store in your fridge for up to one day and after shucking them, always ALWAYS have a smell of your oysters. They should smell of the sea and if any fishy smell emanates from it, throw it out. 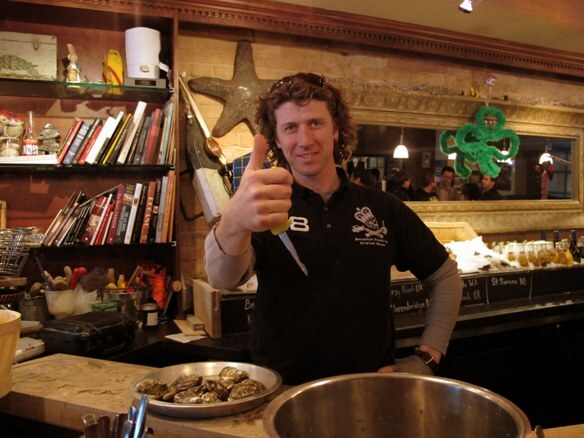 Patrick demonstrating how to properly shuck an oyster. I remember buying a bucket of oysters from two young boys on the side of the road in Newfoundland. We went to the nearest home and they cooked them up for me. They were gritty but memorable to say the least. Your sound so much better!!! Good for you for learning to shuck your own!!! !